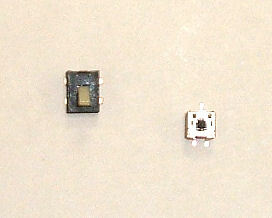 New sensors for the PSP slim motherboard. These sensors let the PSP know that the door is closed and a disc is in. If one or both of these sensors is broken, the PSP will not even spin discs when you close the door with a disc inside! Important: This includes both sensors, circled in blue, in the picture above. The PSP motherboard is not included!